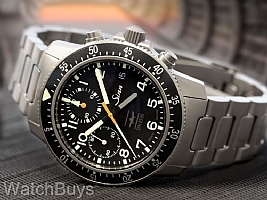 New Sinn DIN 8330 Titanium Chronograph - Now in Stock! This is a brand new release from Sinn, and is one of the world's first watches to meet the new DIN 8330 standards for professional pilot's watches. With the development of the new 103 Ti IFR UTC Series, Sinn has succeeded in meeting precisely these requirements for flight operation in accordance with instrumental flight rules (IFR). This watch is also capable of tracking two times zones through the use of a second hour hand on a 12 hour scale. This hand may be hidden under the primary hour hand when this feature is not needed. Dial is matte black with Arabic numerals and dual color luminous markers and hands. This watch is equipped with a Sinn titanium bracelet with locking clasp.